I love the story of Peter’s mother-in-law, because I can easily relate to it. I remember back when I was about 17 and I was suffering from a terrible cold. I had a raging fever and I was as sick as a dog. 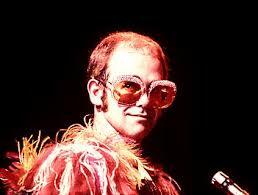 I also had tickets to an Elton John concert. Even though I could barely breath, when the time came, I got myself up out of bead, and whoa-presto, it was as if the power of Elton John’s name had cured me and I was able to follow the Yellow Brick road all the way to the Coliseum where, together with my friends I was hopping and bopping to the Crocodile Rock . So, I have no difficulty believing that when Simon Peter finally brought Jesus around to visit his mother, the sheer power of all the rumors she’d been hearing about this man Jesus, would have been enough motivation for this Jewish mother to rise up out of her sickbed to see who this fellow was who had enticed her son away from his nets. That Jesus could have harnessed the healing power that lies within our grasp as he traveled from town to town and cured the sick and drove out daemons isn’t difficult to believe. Lets face it, first century daemons sound a lot like mental or emotional illnesses, so Jesus ability to cure people who are disturbed by daemons really isn’t much of a stretch. But after centuries of interpretation and proclamation, we tend to hear these stories in ways that portray Jesus as some sort of super-human, miracle-worker, or dare I say it as some sort of God. Because after all, our image of God is that God is some sort of super-human miracle-worker. So for generations we’ve been looking to Jesus in the same way as we look to God to cure all that ails us. And so we are just as likely to appeal to Jesus in prayer, as we are to appeal to God to heal us. So, as our notions about God change, our notions about Jesus change also. When we begin to see God not as some super-human who lives up in the sky, pulling the strings like a grand-puppeteer, the way in which we see Jesus changes as well. As our view of God becomes less of a super-human, our view of Jesus becomes more human. It’s not an easy transition to live through, because most of us have grown to like having Jesus the miracle-worker available to us for those really tough situations when we need to call out a really big name to help us convince the super-human God to heal someone, or something in our lives. We’ve become so accustomed to dropping Jesus’ name to curry favour with the Big Guy Upstairs, that we scarcely know what to do when we are faced with the power of illness to drive us to our knees. As we’ve moved through this sermon series on prayer, several of you have asked me, “What’s the point, then?” “I mean if there’s no Big Guy upstairs or out there who is waiting to hear and answer our prayers, and if Jesus isn’t a miracle-worker, then why bother praying at all?” Well, if you remember, I began this sermon-series by telling you that I firmly believe in the power of prayer, indeed I pray every day. I pray for each and every one of you. I pray for healing and I pray that the daemons that haunt us will be driven out. I pray all the time because prayer works. Now for the tricky bit; how does prayer work? Well the truth is, I really don’t know. I don’t know might sound like a cop-out. But let me assure you that the most valuable lesson I learned in seminary, is that “I don’t know?” is an answer. It’s an answer that the institutional church is loath to give. But I suspect that it is an answer that is as close to the truth as we can come. The trouble with “I don’t know” as an answer is that it isn’t very satisfying. And so, usually after we say, “I don’t know” we proceed to speculate as to how or why. So, let me tell you how I think prayer works. Only please remember, I really don’t know how prayer works. Like all speculation, particularly speculation about the great mysteries of life, all speculation should be made with humility, and it should be heard with a degree of skepticism. I don’t really know how prayer works, but I suspect that it works precisely because the power to heal is ours. I also know, that healing takes many forms. Last Sunday, I talked about the definition of religion. The root of the word religion is “l i g” lig, which is also in the word “ligament.” It means to connect, to join together, to unite, to bring everything together in one body or one wholeness. The little word “re” simply means “again.” Religion is a word that means to re – connect, to put together again. Religion is about binding us together into ONENESS with the ONE who made us. Religion is about connecting us to God, to Creation, and most importantly to one another. Back when I first began to seriously follow Jesus, my faith was challenged by the presence of a little friend of mine who was diagnosed with leukemia. Back in the 80’s leukemia was pretty much a death sentence. So, you can imagine how many prayers were sent up, and I do mean set up, begging God to cure little Kira. People prayed day and night; all sorts of people. We did exactly what it said in the Bible we prayed without ceasing. We prayed all kinds of prayers; we even held healing services in the hope that God would be swayed toward a cure. I went to the garden alone while the dew was still on the roses, and I walked with Jesus, and I talked with Jesus, and I told him I was his own. But there was precious little joy. So, sometimes like the writers of the psalms, I even shouted at Jesus, as I tried to get Jesus to get God to do exactly what I wanted God to do. But after eight years Kira died. I remember not wanting to go to Kira’s funeral. At the time, I told myself that I didn’t want to go to the funeral because I couldn’t bear to see the pain on her mother’s face. But the truth is I didn’t want to go to the funeral because I was afraid. I was afraid that if I went to the funeral, I would discover once and for all what a fraud God is. Indeed, I was afraid that there was no God at all and if the Pastor, through some powerful words of consolation, managed to convince me that God did indeed exist, then I was afraid of knowing such a horrible monster-god, who could let such a beautiful little girl die. I wanted no part of such a god. But if you were to ask me today, “Were all those prayers pointless?” I would have to say, empathetically, “No.” Those prayers made all the difference in the world. Those prayers were effective. Even though many of us were probably locked into the tired understanding of prayer and we were in fact begging the interventionist God, to reach down and save a beautiful little girl, our prayers were incredibly potent. Our prayers were weaving connections between all of us who cared and who grieved and who worried and begged and pleaded. From her parents to the doctors and nurses, to the people who only heard about her and prayed on behalf of strangers they’d never met, all our prayers united us in bonds of compassion that wove us together in love. I would argue that the connections or bonds of grace-filled mutuality and affection, whether in trouble or in joy, are the very substance of God. The love of the community that surrounded Kira’s family revealed the love of God. The strength gathered together in our prayers provided Kira and all those who cared for her the strength she need to be fully alive until the moment of her death. The aura and goodwill that was extended to the family is the balm that aided their healing in the years since her death. Like a deep cut the memory and the scar of Kira’s death will never leave us, but the love and support that was gathered in our prayers provided the salve to heal the wound. The belief that healing is brought about by a super-natural puppeteer in the sky is far too narrow a concept for me to put my faith in. But the idea that healing is only brought about by the application of modern or alternative medicine is also far too narrow a concept for me. There is a tremendous, largely unheralded power in the bonds between people, in the gentile touch we can offer each other, in the hospitable presence of the grace we can extend to both our friends and even our enemies. There’s a story that has always intrigued me that illustrates this reality. You can find the story in a book called “Outliers” written by Malcolm Gladwell, who wrote”The Tipping Point.” It’s the story of a modern-day miracle that takes place in a small American town. Roseto, is a small working-class town in Pennsylvania that was founded back in the late 19th century. From it’s founding to the late 1950’s it was populated by Italian immigrants from a town also called Roseto in Italy. Reseto would have remained a relatively obscure little town had it not been for the work of a medical school professor called Steward Wolf. While attending a medical conference Professor Wolf met a GP from a town very near Roseto who told him that he’d been practicing medicine for 17 years and in all that time very few patients ever came to see him from Roseto who were under the age of 65 and were suffering from heart disease. Professor Wolf was very surprised by this, because in the 1950’s heart attacks were epidemic in the United States. Heart disease was the leading cause of death in men under 65. So, Professor Wolf decided to investigate. Colleagues and students from his medical school were recruited and they analyzed the medical records of the inhabitants of Roseto. The entire population was tested and re-tested. The results were astonishing. No one under 55 had died of a heart attack or showed any signs of heart disease. Indeed, the death rate from all causes in Roseto was 30 to 35% lower than the national average. Wolf’s team broadened their research and brought in sociologists and members of other academic disciplines. They found there were no suicides, no alcoholism, no drug addiction, and very little crime. So, what was going on in this town? They checked their diets. But the locals were cooking with lard not oil. They were eating plenty of sausage and salami. The researchers found that a whopping 41% of their calories came from fat. People in Roseto didn’t jog they didn’t practice yoga. In fact many of them smoked and were struggling with obesity. So the researchers began checking genetics. They tracked down relatives living in other parts of the United States to see if they shared the same remarkable good health and found that they did not. What about the region in Pennsylvania where Roseto was located? Perhaps there was something in the water, the climate, or the soil? But the two closest towns, just a few miles apart, didn’t enjoy the same good health and the water, soil, and climate were all the same. Eventually the researchers realized that there was something in the way the people of Roseto related to one another. How they visited one another. How they stopped to chat . They saw how three generations lived under one roof. They saw the calming and unifying effect of the local church. They counted 22 separate civic organizations in a town of just 22,000 people. They picked up on the egalitarian ethos that discouraged the wealthy from flaunting their success and helped the unsuccessful thrive despite their failures. People are nourished and healed by other people. At one time the little town of Roseto became a laboratory demonstrating that neighborliness is good for your health. Medical journals have dubbed the miracle of this small town the Roseto Effect. Sadly, over time the Roseto Effect has faded as the values instilled in the close-knit little town were traded in for more modern ways of living together. But the well documented Roseto Effect show us that how people relate to each other and the bonds between people are wellsprings of health and healing. When I read or hear stories about Jesus healing the sick and the disturbed, I don’t imagine Jesus as a super-human miracle worker, who dispensed healing wherever he went. I imagine Jesus as a well-rounded human being who helped other human beings realize their own human potential for healing. Jesus helped us realize that the bonds that exist and those that are developed among us can and do heal. When we gather together as the people of God to prayer for one another and for the world. We are not praying to change the mind of some grand-puppeteer in the sky, we are praying to change ourselves, because the God we pray to is the God who is the Ground of our Being, the One in which we live and move and have our Being, the One who dwells in, with, and through, us. Our prayers echo through our community and through our psyche and move us to acts that bind us together in love. It is those very bonds that I believe are the very composition of our God who is LOVE. Next week, I want to talk about some of the things we are learning about those bonds from Quantum Physicists that are changing they way theologians understand the very nature of God and who this new knowledge might help us to understand the mysteries of the power of prayer. But for now, let me just assure you that as sure as I am standing here before you, I am sure that prayer works. Prayer changes who we are and how we act. Prayer moves us to embrace our neighbours in deep bounds of love and that’s a power we have barely begun to understand or tap as we seek the healing that our world so badly needs. So, continue to prayer without ceasing. Open yourselves to the power of God that lives and breaths in, with and though you. So that you can become more fully the human that God created you to be. Embrace all that you are. Embrace your humanity in prayer, embrace it in your life which is the greatest prayer you will ever pray. Feel the embrace of the bonds of love that bind us one to another. Be God’s love in the world. which is the greatest prayer you will ever pray. that bind us one to another. Be God’s love in the world. and the Spirit’s joy! Amen. This entry was posted in Adult Education, Evolutionary Christianity, Progressive Theology, SERMONS, Theology and tagged Elton John, evolutionary christianity, healing prayer, Jesus, Lutheran sermon Epiphany 5B, Malcolm Gladwell, miracle worker, Peter's Mother-in-law, power of prayer, progressive christian prayer, Progressive Christian sermon Epiphany 5B, progressive Christian sermon healing, progressive Christian sermon Mark 1:29-39, progressive christian spirituality, progressive theology, Reseto, spiritual but not religious sermon, spirituality, Super-Human Miracle Worker, The Tipping Point by Rev. Dawn Hutchings. Bookmark the permalink.